I am so grateful for lifelong friendships that have been a part of my life for decades, and for those I have made along life’s journey. I recently enjoyed a reunion with childhood friends. Although most of us are not able to be together often, we still hug, laugh, and cry together as we have for almost 60 years. These friends create a safe place to open my heart and bare my soul. The reunion started me thinking about what are the elements that make it possible to experience true friendships. Sadly, Facebook has increased our reach to friends near and far, but it also has definitely changed the way we do friendship. Not since grade school have I ever thought that someone might “unfriend” me. You remember that recess conversation when a classmate chose to no longer play with you. “You are not my friend anymore.” Now, as adults, Facebook allows the childish response to “unfriend” friends. We friend people on Facebook for a variety of reasons, sometimes simply because we know a common friend, enjoy the same genre of music, or share the same faith traditions. In all honesty, I have friends on Facebook I have never met. It is really unfair to put all this on Facebook. Texting has to take some of the blame for what I call cheapening friendship. We “talk” to friends without ever truly sharing life with them. Technology has changed the face of friendship to one’s best profile picture on a screen. In the past, I think I viewed this verse as a nice adage about friendship, but thought its message to be that perhaps blood is thicker than water. With further study this week, I believe I have a better understanding of the literal interpretation of these well-known words of King Solomon. Through this new view, I look at this verse as a picture of true friendship. The notion expressed is that of a friend who loves in prosperity and adversity. She is more than a friend in time of blessing; she is a friend in time of need. She has a reputation of being affectionate and trustworthy, as one connected by the closest ties of relationship. These thoughts led to me consider how these character traits are reflected in a friendship that indeed withstands prosperity and adversity; that loves at all times. The interpretation of the proverb notes that one is loving and trustworthy. Loving, not with a frail love that goes out with the winds of adversity. But a love that is true and trusting. My friend, Jim van Yperen writes in his book, Making Peace, that love without truth is not love, and truth without love is not truth. I like that, hard as it is to live out. It suggests a love where iron sharpens iron, where a love is trustworthy, and does not waver. A love that is unconditional. 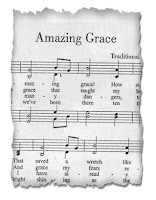 I also believe grace is another trait that must be embedded in a friendship that loves at all times. Grace that is freely given. Grace that seeks the best for another. Grace that hopes. Grace that allows one’s love and trust to eclipse the hard times, and enrich the good times. As I look at the true friendships that run deep in my life, each provide me a safe place to be me. Each is a holding place where my heart is never in danger because their love is trustworthy and their grace is offered unconditionally. They are truly a treasure I hold dear. Who doesn’t remember the scene in Groundhog Day where the mechanical clock radio rolls the digits to 6:00 am, begins playing I Got You, Babe by Sonny and Cher, and Bill Murray finds himself living the same day again? For the past 20 years, I find myself caught in a similar suspension of time and place; a cycle of sadness, over which I seem to have little control. As the leaves begin to change color, and the sun heads south for the winter, my emotions embark on an all too familiar journey. My heart becomes heavy. My memories blur with tears. My focus seems fixed on one sad story. My sixteen year old son, Scott, is dead. Scott’s sixteenth birthday, November 23, 1995, was the last birthday we celebrated with him. A few days later, Scott and Tony brought home our family Christmas tree. We waited another week for Amy to return home from her first semester at college, as Scott declared, “We are never going to decorate our Christmas tree until we are all together.” Little did we know that Christmas 1995 would be the last time we were all together. 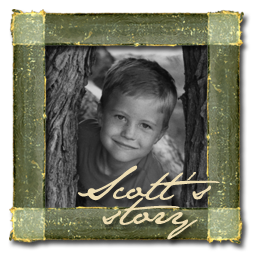 Exactly six weeks after Christmas, Scott was fatally injured in an accident in the woodshop at Immanuel High School. After thirty hours on life support, Scott was declared brain dead. Every year since the year of lasts, my mother’s heart seems overtaken ~ from November to February ~ by some mechanical response that sets in motion a deep sorrow. The earth seems to join in my pain as the sky grays, the air chills, and the nights become long. I tell myself that I am not going to fall under its control, yet here I am twenty years later, still having memories turn to tears. How very tragic if this was the end of my story. How sad if there was no hope of redeeming the future. God is the God who restores; the God who redeems the future by bringing value to our losses. One of the many verses which became real to me as I began my journey of grief is found in the Wisdom Literature. It states, Many are the plans in a man’s heart; but the Lord’s purposes prevail. On Sunday past, I was challenged by the pastor to answer the question, What story is your life telling? As I reflected upon my story over the past week, here are my thoughts in answer to that challenge, as I attempt to flesh out the words of old, the Lord’s purposes prevail. The day of Scott’s accident in 1996, lives were changed for eternity. Scott’s split-second decision to use a rasp file on his table top spinning on the lathe became his last decision. The reality of death became forefront in the minds of his classmates. The certainty of where they would spend eternity became a question that begged an answer. Luke Thomas, one of Scott’s classmates shared at the time, “Lives were changed because of the way Scott Redfern lived and died.” And that is a redemptive facet of my story. Our family struggled to understand this journey of grief. We sought out grief counseling. We became trained in death and grief studies. But most of all, we looked to the Lord to renew His joy in our hearts. Out of our own griefwork was born a desire to give back to others who experience loss. That desire grew into a reality with establishing New Path Center (NPC), a nonprofit that exists to help others discover pathways through difficult times. God has graced hundreds with His hope and peace through the ministry of NPC, and this is the transformative theme of this story. After 30 hours on life support, we gathered around Scott’s body to say goodbye. Kept “alive” with machines to provide the gift of life through organ donation meant we hugged a boy who looked like he was sleeping. That’s the hideous reality of brain death. Yet, as if this story needed another wonderful feature, in August 2015, after almost 20 years, we have had the remarkable experience of meeting a young woman who received Scott’s gift of life. In finding her, we found an entire family who has carried deep gratitude for Scott in their hearts for decades. We have been invited to share the story of our journey, and to hear their story. We have found great joy in knowing the immense value of our loss in their lives as we have received their thankfulness for giving life to their only daughter, only sister. And we rejoice in the restorative aspect of the story. I am grateful for the challenge to look at this story of my life. The pain of losing Scott will always be a part of my story. But what a wonderful experience to look at my story through a lens that sees the purposes of God prevail. As this season brings the opportunity to reflect on the best and the worst that life has brought, I challenge you to consider, what story is your life telling? If you are like me, many are the plans in your heart. Many are the hopes and dreams of your future. But when these plans, hopes, and dreams do not come to pass, what a comfort to know that the Lord’s purposes prevail; purposes that redeem and transform, and restore the joy of the Lord. My heart still feels an immense Scott-shaped hole this Christmas. The deep sadness I felt in 1996 has changed. It is hard to describe, but today it is a sadness bathed in hope. Hope that comes with the birth of the Babe of Bethlehem who truly injects His joy into my story. For as long as I can remember, I choose to view the experiences of my life through a lens that illuminates the amazing grace of the God who restores; the God who will redeem the broken pieces of my life for His glory! It is this personal belief that allows me to move toward experiencing peace with the loss of our sixteen year old son, Scott. The story of these two families is an account of profound grief and overwhelming joy. It is a story I never dreamed I would be cast in; never imagined being played out in my life. Now almost twenty years later, God, in His providence, is changing the story. Well, not exactly changing it. He is writing a new chapter; one that only He could author as it is filled with his amazing grace and promise of restoration. Inspired this summer by a news story about the first hand transplant ever performed on a child, I felt led again to search for the “other” family in my twenty-year-old story. Although they were an integral part of my story, I had never met them. I admit that I searched often to find them since Scott’s death. Now, inspired again by the story of donation, I pulled up electronic copies of newspaper articles from 1996 I had stored in a file on my computer. I enlisted the help of friends on social media. My searching at length over the years always ended in frustration and failure. But this time was different. I was filled with anxiety as I thought about how best to contact this individual through social media. How do you compose a private message to ask someone if she may be the person who received your son’s liver? She was 13 years old in 1996; she would be about 33 years old now. I wrestled with the wording for a couple of hours, forming an introduction, sharing how the gift of organ donation added value to our loss, and then asking “the” question. The stress of choosing the correct words, of not pushing too hard, almost made me back out. Even after composing the message, I waited about twenty more minutes before pushing SEND. As I was turning off my phone at bedtime for the night, I literally began to shake. There was a reply; an answer we had waited almost twenty years to receive. Making the decision to donate Scott’s organs was not an easy one for me, on several levels. It required us to agree with the determination of two neurologists that Scott was brain dead. (Brain death is hideous.) It required us to leave a son who was kept alive by machines. It required us to know that the surgeons would “harvest” (their word) parts of his strong, soccer playing, mountain biking, beautiful body, before “pulling the plug”. We knew the importance of organ donation and its ability to save lives. We made the decision to become a donor family primarily to add value to our loss; to know that Scott’s death was not in vain in this physical world. What a privilege to witness God’s grace at work in the past few weeks since I sent that first message on social media. Tony and I have traveled to Berkeley to have lunch with the three siblings who had been in critical condition in 1996. We heard them share about this life changing event from their family’s vantage point. We were blessed to answer their questions ~ what was his name, how did he die, how old was he, does he have siblings, and what was he like? It became quite clear that although our families had never met, we were indeed an integral part in each other’s lives. So much so, that God’s grace continues to bring us together. Jennifer’s parents flew into San Francisco from Taiwan. We look forward to welcoming them into our home tomorrow. A friend asked me if I was nervous about meeting them. Strangely, I am not. They have been a part of my life for almost 20 years. I feel a sense of joy as we are privileged to see God’s redemptive power over loss. Seriously, it is like I am meeting old friends for the first time. My heart is so heavy this morning from the culminating events yesterday in the courtroom of Judge Sarkisian. I understand the pain of losing a child. I really do. I am so sorry for the family of sweet Ella Joy. But what truly makes my heart ache is the opportunity which was lost time and time again in that Fresno Superior Courtroom, and in the court of public opinion. What could have been demonstrated by those who stood in judgment? What could have been expressed by those who took sides through their posts on social media sites? What could have given the world a truer glimpse of His grace? Yes, I grieve for what might have been ~ that the world would know the power of grace to forgive even the heinous of deeds. It really isn't about what the D.A. believed happened that dreadful day four years ago. What truly matters with eternity in view is for the faith community to show the world a truly amazing grace; a grace that sees the person as full of worth and precious, regardless of any wrongdoing. A grace that can redeem the future in spite of the past. Oh how the Holy Spirit must grieve this lost occasion to demonstrate that while we were yet in our sin, Christ took the penalty for us all – and we.all.walked.away.free.of.sin. Penalty paid. End of story. There is no loophole in the gospel story. Either the cross of Christ covers a multitude of sin, any sin, our sin ~ or we are all at risk of one day falling short of His grace. As the calendar rolled around to the first of November, I noticed that many posts on various social media sites are focused on 30 Days of Thanksgiving. Friends plan to post about something they are thankful for each day of November. I thought about joining in, for indeed this November I have a heart full of thankfulness. But I know a)I really do not have the time for daily postings, and b) I admittedly do not have the discipline (or brain cells) to remember to post something each day of the month. Since I have taken a five-month hiatus from my blog (for reasons that will become evident in this post), I decided to share all in one place some of the things for which I am most thankful this November ~ to express the gratefulness in my heart and to update many of you on the events of the past five months. Tony, my dear husband, who survived a near-fatal heart attack on May 21st. God, who was pleased to give us more time together. The life-saving team of paramedics from Kingsburg Fire Department who responded to my desperate 9-1-1 call at 10 pm that evening. The surgeons who placed three stents in Tony's blocked arteries to save his life. The faithfulness of God to supply all our needs during this time of healing and growth. The wisdom and generosity of our New Path Center Board of Directors for their guidance and grace during the months of recuperation. Family and friends who prayed for us, visited us, cooked for us, and carried this burden with us. We continue to feel the love! Our new heart-healthy eating habits ~ our diet is nearly all plant-based and we feel terrific. We have lost a combined 50+ pounds since May! The turn of the seasons ~ fall has always been my favorite time of year. I love living in this agricultural area, and like the orchards around us, we shed the remnants of a busy year and prepare to enter a season of rest. Birthdays! November brings two birthdays to our home. We celebrate my birthday in a couple of weeks (I will be 59 for the first time. Really.) And we remember the sweet sixteen years we had with Scott on what would be his 32nd birthday. The blessed hope of a glorious reunion with loved ones who have gone before ~ what a comfort to know that the best is yet to come. My heart rejoices this November as we truly could have experienced such a different outcome last May. This coming Thanksgiving, almost six months to the day of Tony's heart attack, we will gather around the table with family to rejoice and acknowledge that the things for which we are most grateful in life are, indeed, not things! Good Friday always finds me pondering the sorrow of Mary as she stands near the cross and watches her son in anguish. The weight of grief she carried as the life of her first born slips away. It is perhaps not so strange that during the holiest of weeks I hear the words of that modern Christmas song echoing in my head ~ Mary did you know that your baby boy will save our sons and daughters? As a mother who has laid her son in the arms of God, I lament with Mary. I grieve for this mother who bore a son only to have his life cut short. I weep with this mother who longed to wrap her arms around him one.more.time and tell him how much he is loved. And yet, I find my own grief overcome with joy because, unlike Mary, unlike those who stood near the cross that day when the sky darkened over Golgotha, I know with assurance what Sunday brings. As I bend beneath the grief of Good Friday, the hope of Easter lifts me. I embrace the power of the resurrection that brings a glorious reunion with those who have gone before. I hold firm to the promise Jesus taught his disciples about his Kingdom, ushered in by his very death. Truly this is the Son of God who redeems the future by his sacrificial death, even the death on a cross. Photo: The Pietà (1498-1499) is a masterpiece of Renaissance sculpture by Michelangelo, housed in St. Peter's Basilica in Vatican City. I was raised in a faith tradition which did not observe the season of Lent, a Christian tradition celebrated in the forty days leading up to Easter. I find myself lamenting that many aspects of this tradition had been part of my upbringing ~ to make time in life's hectic pace to dwell on the passion of Christ and all that He established; to rejoice in the blessed hope of His resurrection. To be honest, I often allow the circumstances of life to rob me of the peace and joy that was established through the death and resurrection of Christ. These temporary struggles seem to lay claim to much of my concentration. With the Lenten season beginning on Ash Wednesday this week, I savor this place of mindfulness. I look forward to entering this season; to rest in the reality that the redemption so freely given on the cross, continues to redeem the future. I find that a verse in The Lorica of Saint Patrick truly expresses this place of rest for me during this season as I recognize the fullness of His being, the depth of His love, and the truth of His promise to redeem all things to Himself. May the passion of Christ and the reality of the resurrection illuminate for each of us the hope of redeeming the future. This photograph of my sister and I from the mid-1950s pretty much illustrates my childhood. I grew up in a home filled with love and joy. Life was good growing up in southern California! Part of the story of my childhood includes how our family came to be. I honestly can't remember a time when I didn't know that my sister, Kathy, was adopted. It simply is part of our loving story ~ that God gave my parents a precious daughter when it appeared they would never have a child. And I never tired of hearing our mother tell the story. How our father's cousin, Stewart Hiatt, was a doctor in California's central valley. How "Uncle Stewart" ~ as we called him ~ telephoned my parents in the spring of 1950 to see if they wanted to adopt the baby of one of his patients. How much joy they felt as they brought Kathy home from a Modesto hospital at the age of three days old. Then ~ wonder of wonders, miracle of miracles ~ almost two years after adopting Kathy, my parents discovered they were expecting me! Bill and Adele Goodrell, who thought they would never have children, were soon to have two daughters to call their own. And, as they say, the rest is history! Then last fall Kathy came for a weekend visit to our home. I showed her the family trees I created on Ancestry.com. If you have worked on this website or watched NBC's Who Do You Think You Are?, you know that Ancestry is a vast database of genealogical information. 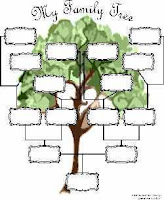 When the information you enter into your family tree matches something or someone in that database, a small, green, spinning leaf appears next to that name on your tree to tell you that there is information in the database about this individual. As Kathy and I talked together there in my home office, she expressed her longing to find her birth mother. I decided to start another tree ~ one that contained what little bit of information we knew about her birth family from the certificate from the hospital, past conversations with Mom and non-identifying information which Kathy had received from the state. Then we sat there talking and waiting and watching the computer screen for a spinning leaf to pop up. Quite a while passed before we accepted the fact that there was not a match for her birth mother's name. For the next three months, each time I logged into my account on Ancestry, there was nothing new to help me find Kathy's birth family. That is until about three weeks ago. After months of trying various spellings of the only names we knew, and researching leads that led nowhere, I decided to try a different search; to compare the names I knew with names that were part of other public trees stored on the website. Within a couple of minutes, I noticed a match. One particular tree contained a name that was on Kathy's unamended* birth certificate, although a subsequent marriage had changed the surname. A public tree on Ancestry is exactly that ~ public, for any and all to see. Additionally, through the website, it is possible to message anonymously the creator of the public tree with questions regarding individuals or dates which are listed. I was quite nervous as I typed a well-thought-out question into the message box of someone I had never met. I even changed my User name to something less obvious and more obscure so if I was about to disturb a hornet's nest, I could not be easily identified. I thought to myself, What's the worst that could happen? Over the next 48 hours, the owner of this tree and I exchanged messages; each message I sent asking more questions that might provide proof that I had found the woman who gave birth to my sister sixty years ago. It was late on Sunday night when I received a message giving me the confirmation that I needed. I had indeed found Kathy's birth family. I stayed up till almost 3 a.m., just connecting the dots between all the facts that I now knew. The following morning I shared all my findings with my husband to check the accuracy of my information before calling my sister with the news. I was blessed to make the initial telephone call to the birth sister who was four years old when Kathy was born. What an experience to know that, although her birth mother is no longer living, Kathy's birth family now includes five siblings. The past three weeks have been an adventure as I dig through boxes of our family photos and compare pictures of Kathy with pictures of her birth mother and siblings. The resemblance is truly remarkable! There is so much to share from my perspective of watching this precious, long overdue reunion. I find great joy in the reality that the very process of redeeming the future is taking place before my very eyes. Note: Since my wonderful experience with Kathy, I have had the opportunity to help two of our friends, also adoptees, begin the work of redeeming the future. 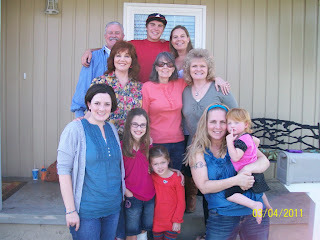 ***UPDATE: Kathy's sister, Connie, flew out from Texas this past week to meet all of the family. We had a wonderful time welcoming her into the clan, and looking at pictures she brought along. It was absolutely amazing to see the family resemblance even into the third generation! The photo shows three generations of Redfern~Goodrell~Briggs~Robinson families, including the Hardwick~Doolittle~Warner families! The winter of 2010 is one for the record books ~ bringing a white Christmas to many places that normally only dream of snow; it's blustery cold continuing to dump snow and ice for weeks. Many schools have been forced to call extra Snow Days and cancel classes. Where I live, winter brings the Tule Fog (pronounced too-lee). Tule Fog is a thick ground fog that settles in California's Great Central Valley, named after the tule grass wetlands (tulares) of the Central Valley. When the fog "hits the deck" (as they say in weather talk) the schools call s Foggy Day Schedule, delaying the start of the school day until the fog lifts enough for the buses to safely make their rounds to pick up their precious cargo. There are winters when we do not see the sun for weeks! I remember when our children were school age, we could almost predict if a Foggy Day Schedule would be called as we could not see the house directly across the street. Yes, Tule Fog is that bad. I have driven at night in Tule Fog and needed my window down just to see at least three yellow dotted lines ahead of me, to keep my car in my lane and on the road! Today it is very foggy outside once again. As I watched the list of Foggy Day Schedules grow on the morning news, I thought about times in my life when my path seems foggy. Times when I can not see very far ahead because the stuff of life blocks my view. Times when I am not certain I am still on the road. The foggy days of life are when my faith is stretched to not trust in what is seen or felt, but on what is hoped for and what is known to be true. I have walked enough foggy roads in life to know that my faith in God is not a product of His willingness to clear out the fog or to create the life which I desire. No, my faith is rooted in my belief that His will cannot take me where His grace cannot keep me. It is a faith that knows, even in the Foggy Day Schedules of life, He will illuminate for me a path through the fog, to fulfill His purposes.